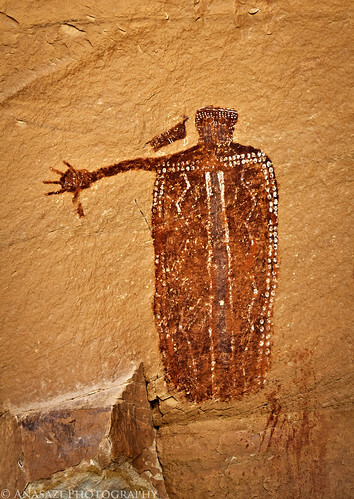 ‘The Hitchhiker’ is a surprisingly well preserved Barrier Canyon Style anthropomorph hidden in a remote canyon of southern Utah. It’s part of a larger pictograph panel known as The Perfect Panel because of it’s amazing state of preservation. It’s obvious where the nickname ‘hitchhiker’ comes from while looking at this figure, but if you look closely at the ‘extended’ thumb you will notice that the finger is shorter than the other fingers. There is actually a small zoomprph figure right below the thumb that makes it look longer if you don’t pay close attention to the details. This anthropomorph also has a highly stylized ‘attending dog’ type figure on it’s shoulder. The Perfect Panel is probably the most elaborate and best preserved pictograph panel I have had the pleasure of visiting so far. I will definitely be posting more photos from this panel in the future!